In this day and age of computer use in both professional and personal settings, it is important for individuals to understand the impact of body mechanics. 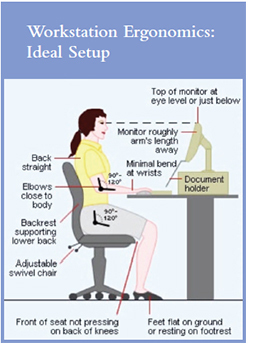 Proper practices and setup of the computer workstation can help with the prevention of repetitive motion injuries and musculoskeletal stress. Many ergonomic improvements can be made through simple changes such as seat and monitor height adjustment. A comfortable working posture in which your joints are naturally aligned is called “neutral position.” Working with the body in a neutral position reduces stress and strain on the muscles, tendons, and skeletal system and reduces your risk of developing a musculoskeletal disorder (MSD).